Rickshaw drivers in rain in Dhaka. Image from CNN article referenced. CNN reports that the number of people being killed by lightning strikes in Bangladesh has increased dramatically: last Thursday 34 died, 21 on Friday, 7 on Saturday and 3 on Sunday. Officials say that deforestation has "exacerbated the problem" with farmers working in open fields now where they are targets for lightning strikes. For comparison, five people have been killed so far this year in the U.S. despite our population being double that of Bangladesh. What purpose does lightning serve on the earth? The earth's crust is negatively charged but the ionosphere (a layer in the atmosphere above 50 kilometers) is positively charged. The atmosphere between these two regions is slightly conductive which allows current to flow between these two regions. The earth-atmosphere potential "would disappear in a mere five minutes" were it not for lightning which, on a global scale, acts to separate charges on atoms. This mechanism overrides the fact that on the scale of a single thunderstorm, lightning releases electrical energy built up by the storm. Thunderstorms contain a lot of ice crystals and hailstones. Meteorologists believe, though the reasons are not well understood, that millions of collisions among these small solid particles cause the storms to evolve with a positive charge near their tops and a negative charge lower down. 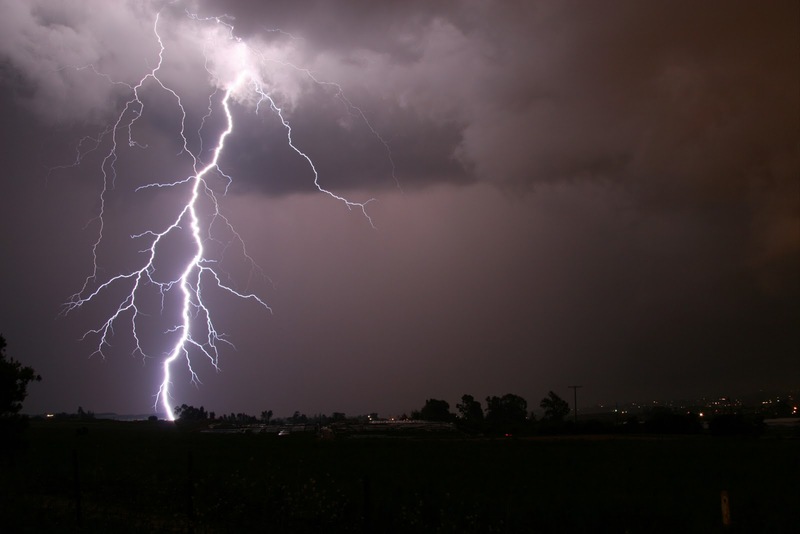 In a typical cloud-to-ground lightning strike, negative charge descends to the ground and the objects struck release a positive charge upward. The net effect keeps the charge of the earths crust negative. One of the more fascinating explanations on this page tells how a cloud-to-ground flash evolves. A series of "stepped leaders" move a bundle of charge a distance of only about one city block. Each step takes about a microsecond, followed by a pause of about 50 microseconds, and then another step. At each step, the evolving bolt may change direction toward a stronger electric field area, resulting in a final flash that is full of zigs and zags. On the ground, there may be several regions of opposite charge, causing the bolt to split into several branches as it nears the ground. Just before reaching the ground, the leading step induces an electric potential of some 10 million volts. This is sufficient to bring up surges of positive charge from sharp objects or irregularities near the ground. Once the negative tip of the bolt and the rising surge of positive charges meet, typically a few tens of meters above the ground, the connection between the cloud and ground is established. The return stroke "zips upward at a rate much faster than the stepped leaders descent." It is this return stroke that produces the visible flash. Air surrounding the bolt is heated to about 30,000 C (54,000 F), creating the shock wave that we register as thunder. "How can I avoid being struck by lightning? Shelter is not failsafe. Lightning can strike though telephones, except for the cellular variety. You should avoid taking showers or standing by windows, screen doors, or patios. To protect household appliances, unplug them before (but not during!) electrical storms. Outdoors, the idea is to avoid being near--or being--the highest object around. Get away from isolated trees, metal fences, wire clotheslines, and the like, and avoid standing in an exposed area or near water. If you are the tallest thing around, or in a boat on open water, crouch down to reduce your height (but don't lie flat). Lay down metal sports equipment and dismount bicycles. Take especially swift action if your hair stands on end, as that means charged particles are starting to use your body as a pathway. The safest form of vehicle is one with a fully enclosed, all-metal body, which helps to channel electricity around the interior. Make sure the car's windows and doors are completely closed. Finally, remember that lightning can, and often does, strike the same spot more than once--even the same person. U.S. park ranger Roy Sullivan reportedly was struck seven times between 1942 and 1977."